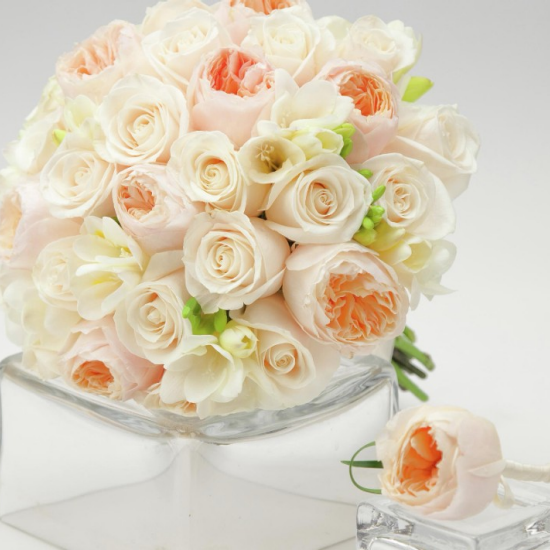 Embrace the simplicity of having your Las Vegas wedding desires met to the very last detail. At Bellagio, the only requirement is your presence. By entrusting your important day to Bellagio, be assured that every detail is addressed in our quest to maintain a legacy of extraordinary service. We invite you to peruse our bliss-filled wedding offerings and begin envisioning your story. Let us help you begin happily ever after with our specially designed packages that take care of every detail for your dream wedding. Yes, that means we’ll even help you pick the perfect glass slippers. Start planning your dream ceremony today. If aspirations of a more intimate union have captured your heart, then the inviting charm of our East Chapel will romantically satisfy, with gracious space for 30 guests. Our South Chapel is ideal for accommodating up to 130 guests. This masterpiece is an idyllic backdrop for your picture-perfect union. This magnificent terrace is available to you for day or evening events and can accommodate up to 34 of your most loved guests. An expansive terrace with a stunning view of the Fountains of Bellagio creates a stunning atmosphere for your guests over the age of 21. Create a lifetime of memories with up to 10 standing guests, or cherish this precious moment with just the two of you. We've gathered together the world's finest flowers to pique your interest and dramatically satisfy your discerning taste. Please allow a minimum of one month notice for customization. You’ve come to Las Vegas for your dream wedding and the day is set to unfold exactly how you envisioned it. If the only things missing are some of your beloved friends and family who couldn’t make the journey, let us extend an invite so they can still experience your wedding at Bellagio. That’s right—our skilled technical team can broadcast your ceremony and celebration in a live webcast to be viewed by your very special guests back home. This way they won’t miss a thing and you can feel their presence during the most important day of your life. Our experts offer an array of beauty services to enhance your best features. A variety of options are available for both Brides and Grooms. Our staff can help arrange your dining experience from start to finish. Private and semi-private options are available. Elegant in-room dinners, receptions, and celebrations are our speciality. Invite your guests, friends, and family to entertain in the privacy of your room or suite. We will work with you to ensure every detail is just as you had envisioned. Services for your whole party. Let our Social Team take care of your group experience from start to finish. 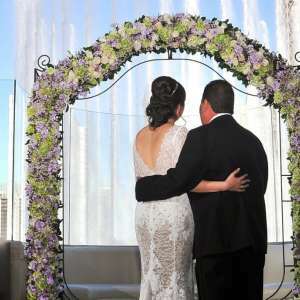 The Bellagio Wedding Chapels are pleased to offer our Wedding Couples who are marrying with us in the Chapels or on our Terrazza a courtesy discount on our standard Deluxe Guest Room of up to $50.00 per night on rack rates only***. Please contact one of our Wedding Coordinators for additional information. ***Terms & Conditions: This offer is based on promotional availability. Rates are per room, per night, based on double occupancy plus tax and daily resort fee. The Wedding Couple discount is not available if booked through a package, travel agent, or special rate and may not be combined with any other offer. Discounted room rates can only be reserved with your Wedding Coordinator by calling 1.888.464.4436 or 702.693.7700 between the hours of 9:00 AM and 5:00 PM Pacific Standard Time. The discount applies only to those Wedding Couples who have paid their non-refundable deposit. Discounts on suites may be available. Prior bookings via Bellagio.com or Bellagio Room Reservations will require a room confirmation number for verification of the Wedding Couple applicable discount. Offer is subject to change without notice. Guaranteed reservations require the first night's deposit plus room tax. Cancellations are refundable up to 48 hours in advance of the check-in date. Cancellation of your wedding package will result in a cancellation of your room reservation. ©2018 MGM Resorts International®. All rights reserved. Follow signs for the Promenade Shops. Follow the Promenade Hall all the way to the end. Take the automatic left (The Monet Patio will be on your left). Take the next left and you will be facing the wedding chapels. Enter the Bellagio Conservatory and follow the left pathway. Enter Via Fiore near the Salon and Spa. Follow Via Fiore to the end, you will pass Harvest. Take the next two right turns. The Wedding Chapels will be on the right, just past the Grand Patio.